Design and Production Incorporated, a full-service production and installation integrator, recently completed an $8.5 million renovation of the Carter Presidential Library and Museum in Atlanta, Georgia. From a fully interactive touch-table that pairs live projection with user-activated navigation, to a 6-panel projector-supplied rotunda, the Museum delivers historic materials through cutting-edge technology. Thirteen of Digital Projection International’s displays, including six 8,000-lumen TITAN HD-600 projectors and six dVision 1080p projectors, are delivering active imagery from numerous periods of Jimmy Carter’s life. President Carter, former Vice President Walter Mondale and a host of national dignitaries celebrated the re-opening of the Carter Museum on October 1st, 2009. With over 70,000 square feet of museum showcase space and research facility, the Carter Library and Museum includes numerous new exhibits of note that employ advanced projection equipment. A large rotunda serves as the centerpiece to the museum, where six 13-foot-tall, vertically-oriented screens display “A Day in the Life” of Carter’s presidential responsibilities. The presentation depicts a day’s activities from early morning until the end of day through video clips, photographs, sound recordings and news footage. Accenting this show are four 65” LCD screens, positioned below the large projector-illuminated screens, creating an encompassing, 10-image synchronized show. The TITAN HD-600 projectors supplying the large-screen imagery are positioned in portrait mode, thereby creating images much taller than they are wide without having to blend two projectors. Additionally, no mirrors are needed to achieve the effect. 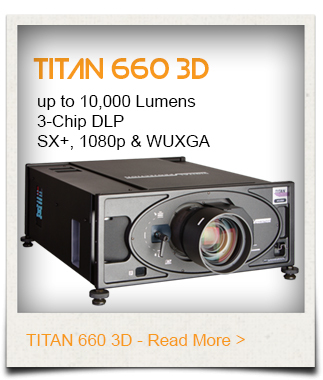 All of Digital Projection’s advanced dual-lamp TITAN projectors are designed to function in either horizontal or portrait mode interchangeably, while still offering full lamp life and imaging performance. From a humanitarian standpoint, the former president is considered one of the most active in U.S. history, and Design and Production Incorporated created a dynamic presentation which excels at presenting his diverse activities. 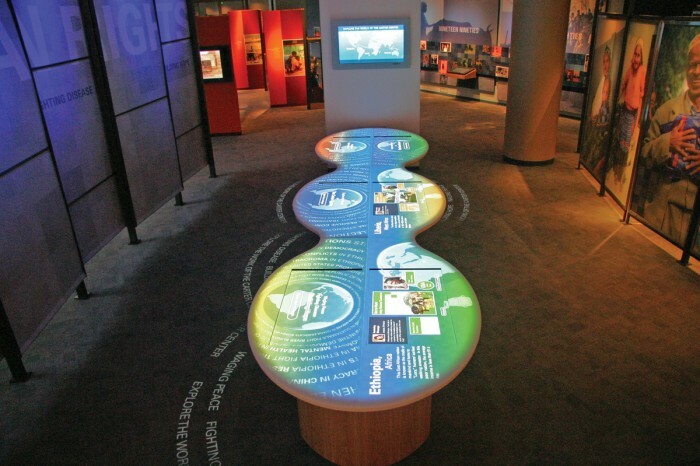 An 18-square-foot Corian-topped interactive table offers a user-navigated overview of post-presidency endeavors, ranging from disease prevention to Habitat for Humanity volunteer initiatives. “The table itself serves as a projection surface,” commented Dale Panning of D&P. Panning continued, “Embedded are six IRTOUCH T46 infrared touch frames. Six Digital Projection dVision 1080p-XL projectors provide imaging for both the interactive table and teaser text on the floor around the table.” Interactive content is fed to the projectors by computers located within the interactive table.